We absolutely love to travel with our kids! No screaming kids during the flight, no grumpy kids when we visit a nature park, no hassle with the kids in long waiting lines for the customs… travelling with kids can be very simple if you are prepared! To make sure you leave for your holiday fully prepared, I have written down the TOP 10 musthave travel gadgets for travelling with kids. Believe me, your life will be much easier if you take these gadgets with you on your next family holiday. And he, isnt it time for life to be easier en simpler?! Yes, there it is.. .on number 1, the good old Ipad. For us this is the most indispensable travel gadget for travelling with kids. We use the ipad for long flights, long drives, when waiting in long custom lines and for jetlagged kids who don’t sleep in the middle of the night. I believe the Ipad is capable of solving lots of your travelling with kids annoyances. Make sure you download books, games and movies that can be watched offline as well, otherwise the Ipad will make your problems bigger instead of smaller ;). Family holidays make the most beautiful memories, I want to be able to make a mental picture of every cherishable moment. As I don’t have a photographic memory, this ain’t gonna happen. Therefore we always take a good photo camera and an action came with us. We took the TomTom Bandit action cam on our last family holiday to the States. Because of the compact selfie stick and very simple usage, we as well as our oldest could easily make videos of our adventures. Its amazing to what those videos and enjoy your holiday all over again. Is your little one 2 years or over? If so, we have the perfect “make your life easier” gadget for you, we present the FlyLegsUp.It looks like a hammock which you can attach to your table. It will turn into a little hammock bed in which your child can enjoy a wonderful night sleep. Giving you the opportunity to enjoy your dinner, have a sip of wine and enjoy your favorite series. Definitely an unmissable item in this list of travel gadgets for travelling with kids! 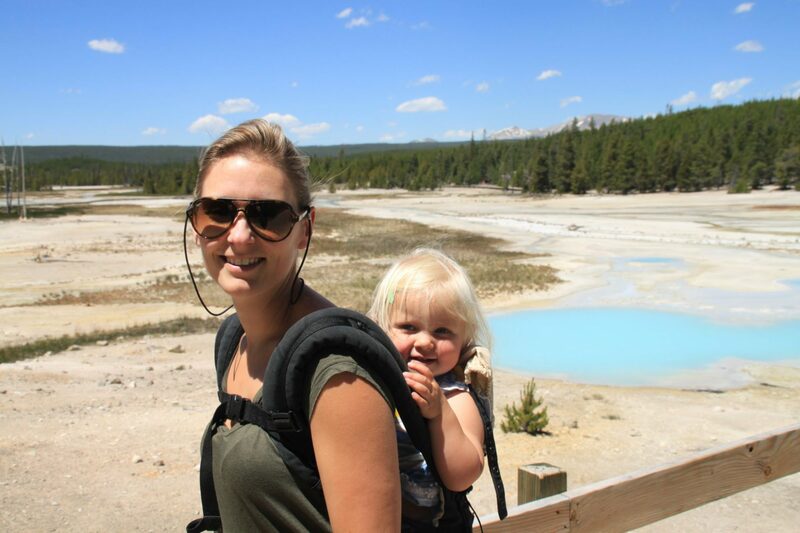 When travelling with babies we wanted to take hot water with us on the flight, travelling with toddlers we wanted to take cold water with us. During our hikes in the National Parks and when exploring the jungle of Thailand a cold sip of water can be the biggest treat. We bought ourselves and the kids Sigg bottles, they keep warm water warm and cold water cold, perfect! They are very strong and therefore long lasting as well. When you have finally reached your holiday destination, you want to relax and enjoy your new surroundings. Of course it helps a lot when you can move around in a simple and safe way. We always take our stroller and kids carries with us as carry on luggage. Doesn’t sound very clever, but I can reassure you it is! At the airport we always have one kid in the stroller and the other one in the carrier. When approaching the gate, we drop off the stroller, taking the carrier with us on board. During the flight I use the kids carrier to have my hands free, being able to have dinner and read a book. Our baby loved to sleep in the baby carrier, which came in very handy when she turned to big for the baby basket but was still to small for her own chair. Check out the best strollers for travelling. At our destination we use the stroller when exploring a new city and the carrier for hikes. For the youngest we bought ourselves an Ergobaby baby carrier and for the oldest we use a Deuter kid comfort III, a bigger kids carrier. They are both very comfy for the kids and gives you the opportunity to explore nature to the fullest on your hike. Say what? We agreed on the fact, the Ipad is absolutely unmissable on every family holiday. Therefore it’s very important the Ipad survives the whole vacation as well. To make sure it does, we use the Kids Cover. It’s an Ipad cover especially designed for kids, with a big handle and even bigger shock bumper. When you use a screen protector as well, you Ipad is absolutely 100% kids tantrum proof! Before our holiday both kids picked their own travel pillow. You can find them in any color, shape and animal. Our kids absolutely love them, they are used both as pillow and stuffed animal. As they are quite big we attach them to our backpacks, making sure we have them at armlength at all times. The kids use them for a nap at the airport, in the airplane, in the car, in the RV and occasionally even in their beds as their favorite cuddle pillow. Imagine hearing Fireman Sam for the third time in a row…. Most parents don’t get utterly happy by this thought. Now imagine hearing Fireman Sam 3 times in a row, from 2 different Ipads with approximately 1 minute delay. If it gets on your nerves, it will probably get on the nerves of your neighbor in the airplane even faster. THE best tip when your kids are using the Ipad, give them headphones. This way they can even watch Fireman Sam 6 times in a row without annoying anyone. We have already mentioned the action cam for the best videos. Of course you want to be able to save these beautiful memories in a photobook as well. Yes you can also take photos with your mobile, but let’s be honest, the quality of these pictures doesn’t come close to the quality of photos taken with an actual photo camera. Not to mention how they look when blown up to A4 format. Ok, this might not sound as one of the best high tech travel gadgets for travelling with kids, but believe me it’s a perfect travel gadget! The kids will be very happy to play with the window stickers anywhere you find windows. Do not be mistaken, on a daily basis even on your holiday, you will find a lot of windows: at airports, in the airplane, in the car, in the RV, in the local grocery store and yes even in the mall. Are your kids bored? Give them window stickers and you won’t even notice they are there ;). Are you travelling with a baby or toddler? Yes? Than this is the perfect gadget for you: the Deryan travel cot. It’s a portable travel cot, with inflatable mattress and integrated mosquito net. This portable little bed makes sure your little one always had a safe and comfy place to sleep. It works not only for a nap in your hotel, apartment, tent or RV but is also a perfect portable playpen at the beach or swimming pool. So far our TOP 10 travel gadgets for travelling with kids. For us these travel gadgets make travelling with kids even more enjoyable and relaxed. Of course this list could be way longer, what do you think of a portable car seat? 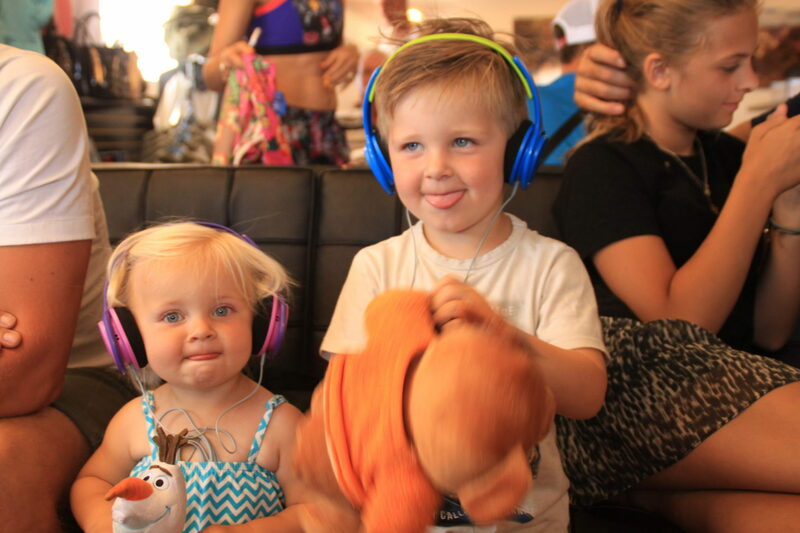 What’s you favorite travel gadget when travelling with kids? Some times taking your own car seat might seem the best choice. Check this article on how to travel with car seats before you take off. Travelling with young kids? 10 Must have items for in your luggage!